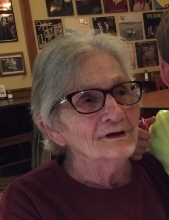 Barbara Jean Earle, age 82, of Jacksonville, passed away Thursday, February 7, 2019 in Tyler. She was born on August 16, 1936 in Troup to John and Ethel (Mixon) Terry. She worked as a machine operator for Tally-Ho. Barbara was preceded in death by her parents; husband, Arlon Earle and a brother, Johnny Terry. Left to cherish her memory are her children, Bettye Earle Turney and husband Mark, David Earle, Paul Earle and wife Allyson, John Earle and wife Elizabeth, all of Jacksonville, Milton Earle and wife Lisa of Ft. Worth and Phillip Earle of Portland, OR; brother, Charles Terry of Athens, GA and sister, Carolyn Lewis and husband Gary of Jacksonville. She is also survived by Grandchildren are Candace Earle, April Huckaby, Jason Turney, Jessica Earle, Austin Earle, Ryan Earle, Eric Earle, Hannah Earle, Amber Earle, Brittany Earle, Chelsey Earle, Cody Earle, Phillip Earle Jr., Leslie Earle, Lydia Earle, Lilly-Anne Earle, Jennifer White and Taylor Elkins; 12 great-grandchildren; and several nieces and nephews. A funeral service is scheduled at 2 o’clock in the Saturday, February 9, 2019 at Autry Funeral Home Chapel in Jacksonville. Visitation will begin at noon. Mrs. Earle will be laid to rest at Earle’s Chapel Cemetery in Jacksonville. Pallbearers will be John Earle, Paul Earle, Phillip Earle, Jason Turney, Jonathan Lewis and Ryan Earle. "Email Address" would like to share the life celebration of Barbara Jean Earle. Click on the "link" to go to share a favorite memory or leave a condolence message for the family.